Sometimes our love relationship goes wrong. Sometimes our love relationship goes wrong. We encounter a period of difficulty with our partner but with good communication and mutual respect we once again restore harmony. Sometimes, no matter how hard we try to fix things in a relationship, nothing seems to work. Things become difficult and hard to understand and we feel confused. All we know is that if this is love, why do we feel so bad? All of these behaviors are designed to intimidate and control the victim. Confronted with these behaviors an abuser may deny that they have occurred or blame the victim for making him/her act in a negative manner. Women can be abusers as well but statistics confirm that 86% are male. If you are unsure what is or isn’t acceptable behavior, please seek professional guidance from a crisis counselor at Interval House for assistance and support. 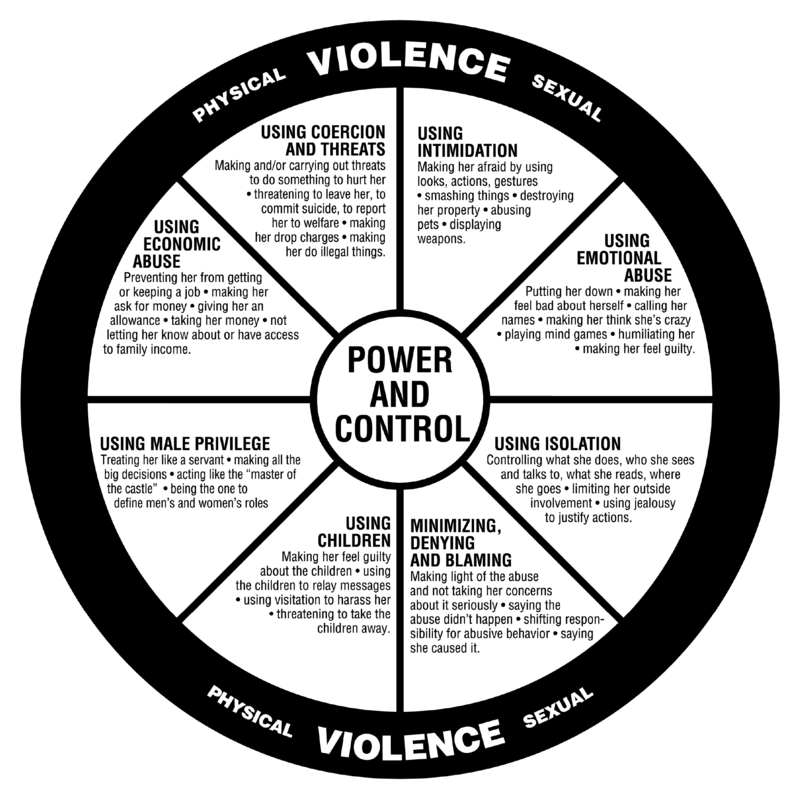 The Duluth Power & Control diagram is a helpful tool in understanding the overall pattern of abusive and violent behaviors. Very often one or more violent incidents are accompanied by other types of abuse. These are less easily identified but clearly show a pattern of intimidation and control in the relationship. This cycle does not describe all violent relationships or all survivors’ experience of abuse. Domestic violence often involves a cyclical or recurring set of behaviors which will only increase in lethality and frequency over time. 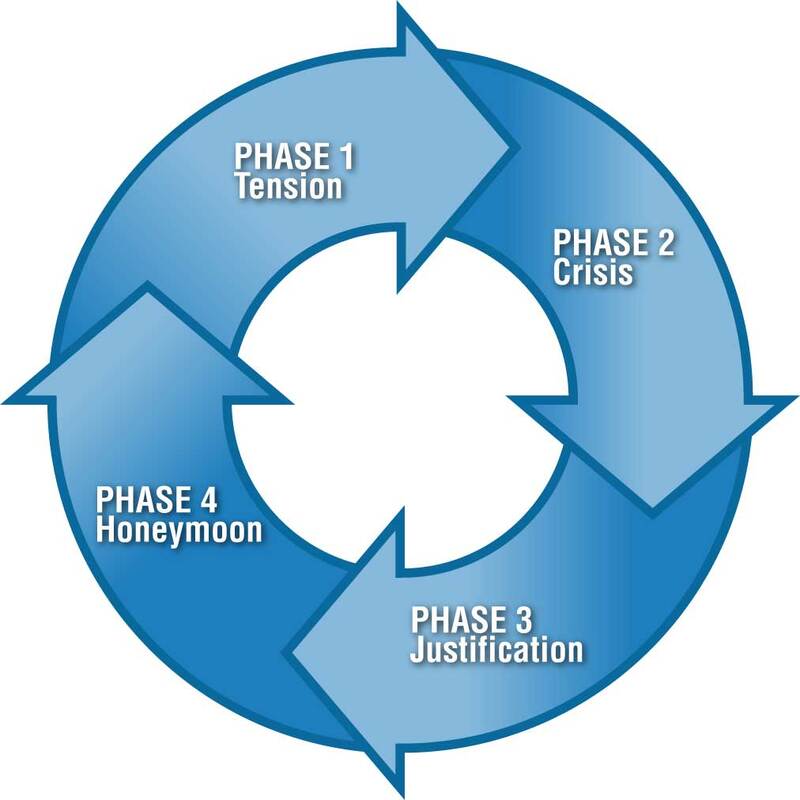 This cycle may be more descriptive of events early in the relationship and not of chronic, long-term abuse. Perpetrators fly into a rage, give their partner threatening looks, and fall silent for long periods. Victims feel anxious, try to lighten the atmosphere, and are careful about what they say and do. Perpetrators verbally, psychologically, physically, sexually, or economically attack the other person. Victims feel humiliated, sad, and see the situation as unfair. Perpetrators make excuses for their behavior. Victims try to understand the explanations, help the perpetrator change, doubt their own perceptions, and feel responsible for the situation. Perpetrators beg for forgiveness and talk about therapy or suicide. Victims give the perpetrator another chance, offer help, acknowledge the perpetrator’s efforts, and modify their own behavior. In order for a person trapped in the cycle of domestic violence to free herself, intervention by a family member or friend is often necessary. Offer her your support to stop these unacceptable and often criminal acts.